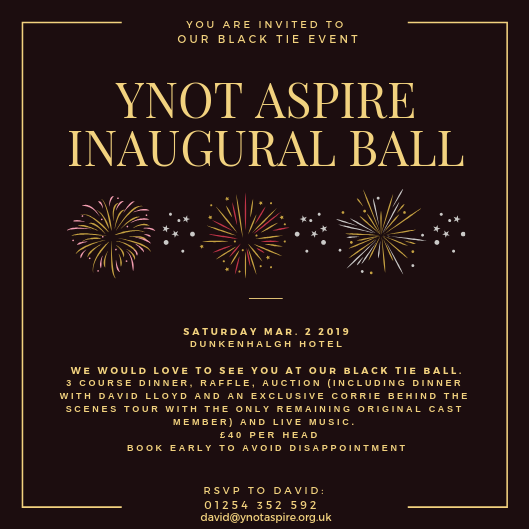 We are thrilled to invite you to our Inaugural Ball at the Dunkenhalgh Hotel on Saturday 2nd March 2019. The Black Tie event includes a 3 course meal, amazing raffle (including a £500 jewellery voucher), an auction with some exciting lots such as dinner with David Lloyd and an exclusive behind the scenes Coronation Street tour with the only remaining original cast member! There will also be live music and a disco into the small hours. At only £40 per head, this is a fantastic opportunity to dress up to the nines and enjoy an exciting evening of fun and entertainment. The Dunkenhalgh have agreed a room rate of £80 for the night, including breakfast. If you would like to book a room please let them know that you are attending the ball. On top of all of that, you will be helping us to raise vital funds to enable us to continue providing the range of projects and initiatives that we run for young people in Hyndburn. If you are unable to attend but would be interested in sponsoring the event please get in touch. Any sponsorship would be widely publicised through our social media platforms and press release as well as in our programme and presentation on the night.